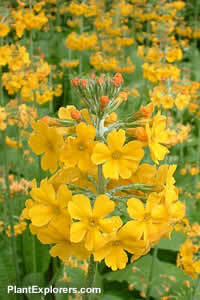 This rosette-forming evergreen Candelabra primrose bears up to 7 whorls of up to a dozen salverform fragrant golden yellow flowers. Height and spread 24 inches. For maximum freshness, please keep seed refrigerated in its original packaging until it is time to plant. Sow seed in containers in an open frame in late winter or early spring. Grow in deep humusy moist neutral to acidic loamy soil in part shade. Can take more sun if the soil is reliably moist.